2011 Yamaha YZ125. Picture credits - Yamaha. Submit more pictures. The YZ125 is ready to race out of the crate, complete with a ProTaper� aluminum handlebar, titanium footpegs and gripper seat. A pure motocross machine, the light and nimble YZ125 is the perfect choice for riders stepping up from the 85cc class. Price as new (MSRP): US$ 6250. Euro 6695. Prices depend on country, taxes, accessories, etc. 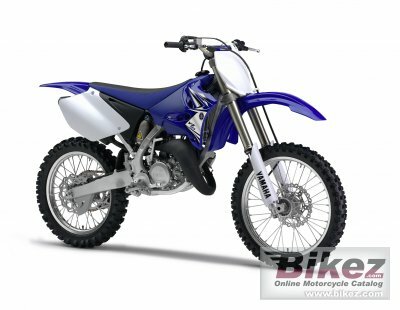 Ask questions Join the 11 Yamaha YZ125 discussion group or the general Yamaha discussion group. Bikez has discussion forums for every bike. View comments, questions and answers at the 2011 Yamaha YZ125 discussion group. You can sign up for e-mail notifications when other riders answer you. If you have extensive experience with the MC, please send us a review. If you consider buying this bike, you should view the list of related motorbikes Look at photos. Compare technical specs. And check out the rating of the bike's engine performance, reliability, repair costs, etc. You can compare the rating with other bikes.